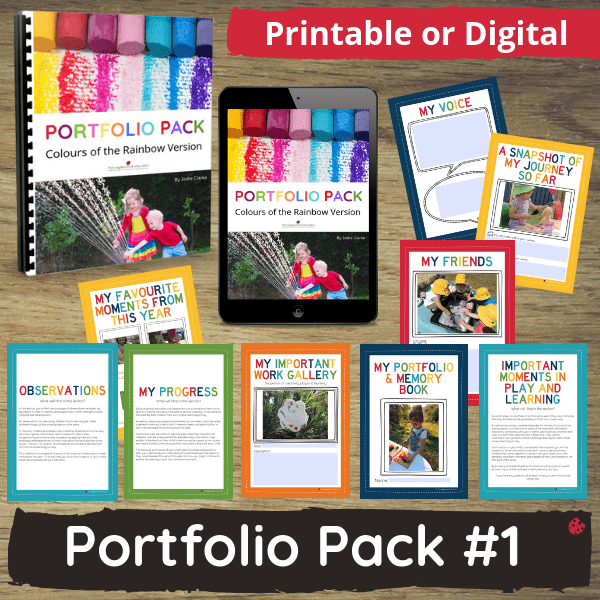 Use these PORTFOLIO PACK PAGES to help you organise important documentation, special moments, samples of work, progress updates, assessments, snapshots of learning for each child’s individual learning journey. Easily show evidence of consistent and comprehensive planning, collaboration, recognition and extensions of learning for each child. 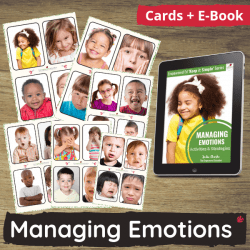 Use as a digital document and enter text and photos on the computer (sharing via USB, the cloud or email) or print and compile as a book or folder for easy everyday access by other educators, children and parents. 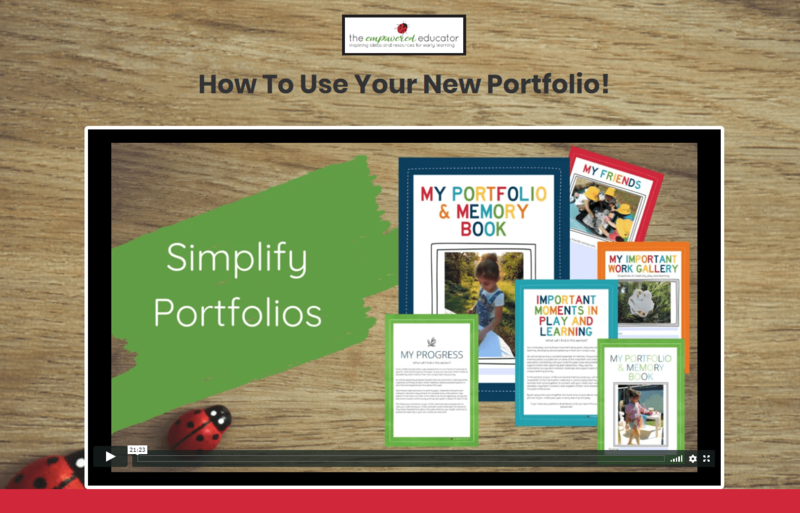 Includes access to a tutorial video on setting up and using a portfolio/learning journal and memory book. Suitable for all FDC, Family Childcare, Preschool, Centre Based LDC, Occasional Care and OOSH services! HOW CAN I USE THIS PORTFOLIO PACK ? An organisational and time management tool. No more end of year panic attacks!! A record of consistent documentation evidence. 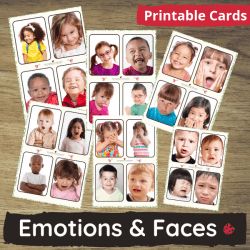 A digital or hardcopy keepsake for parents. A simple way to show a child’s learning journey throughout the year using images, stories, anecdotes, the child’s voice and various documentation tools and summaries. A way to share and explain to families and carers how their children have been learning through play in the early years environment over the past year. As a prompt to invite collaboration with families, reflection and a guide to further learning at home. As an easy to follow resource that will help you understand (or remind you) of what documentation evidence you want to include and why. Simple explanations and suggestions included on the title pages – Observations, Reflections, Forward Planning, Important Activities, My Progress (Helpful for those summative assessments!) . A playful way to seek and record each child’s voice and input – while also supporting their self awareness and sense of belonging. A document that you can easily add to here and there throughout the year as you get time to avoid the stressful end of year portfolio compilation scenarios! A unique way to recognise, journal and celebrate the process of learning and development of each individual child. Access to a tutorial video showing you step by step suggestions, tips and strategies for setting up and using a portfolio/learning journal/memory book to cover a wide range of outcomes – instead of just a pretty book you need to IN ADDITION to your regular paperwork throughout the year! You will receive a confirmation email with an official receipt and link to download the digital resources immediately after payment is completed…all files are in PDF format and saved as high print quality . Please note these are digital resources and not mailed out as hard copies. Use on your computer or tablet device to save on printing costs then email, save to a USB stick or upload to the cloud to share with parents at the end of the year!